I was stalking Zara at Souk Sharq for a particular item (the SA assured me it would be there by the 2nd day of Eid, as if I was supposed to just drop everything and go shopping lawl) and of course I made a quick stop at Sultan Center. Right off the bat, I spotted the Scratch & Win display. 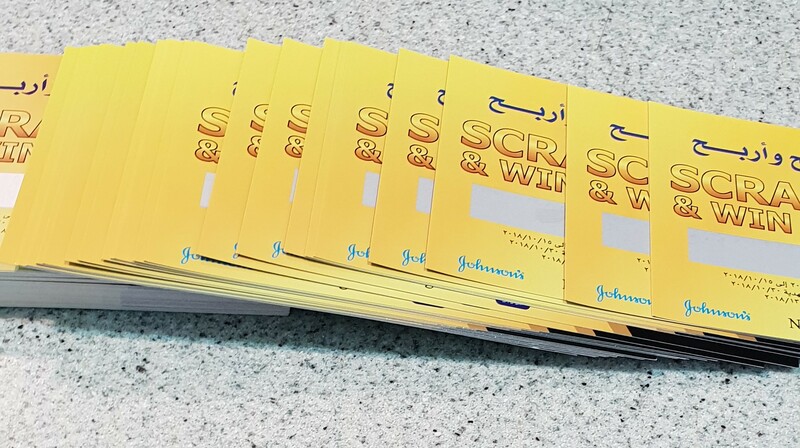 Basically, for every KD 4 purchase of Johnson’s products or Neutrogena products or Clean & Clear products, you qualified for a Scratch Card. The featured product seems to be the somewhat new Neutrogena Hydrogel Face Sheet Masks. I took a few photos of some random personal care items too, but I was haaangry so I didn’t take that many photos. 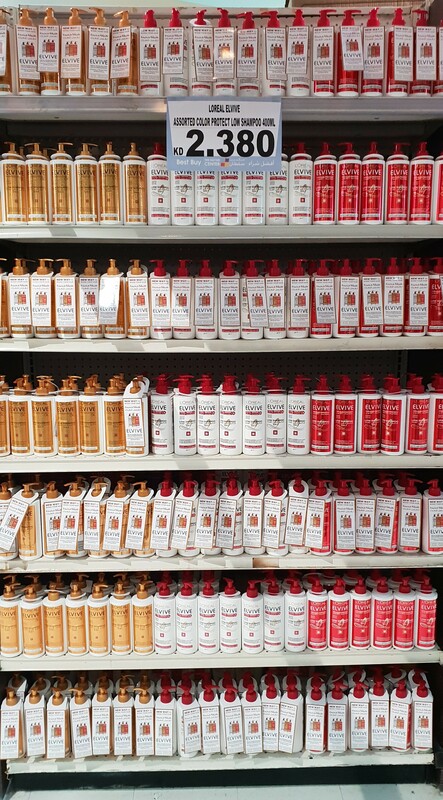 As you can see, the display contained items from all 3 of the aforementioned brands (Johnson’s – Neutrogena – Clean & Clear) meaning you didn’t necessarily have to stick to just one brand, you could mix and match. The Neutrogena Hydrogel Face Masks were included in the offer. Neutrogena Makeup Removing Wipes (fan favorite) were also on the table (literally) as well as Johnson’s Cotton Rounds and Johnson’s Earbuds, etc… Basically, if you wanted to stock up on essentials, now would be a good time (to qualify for the promo and hopefully win something worthwhile). 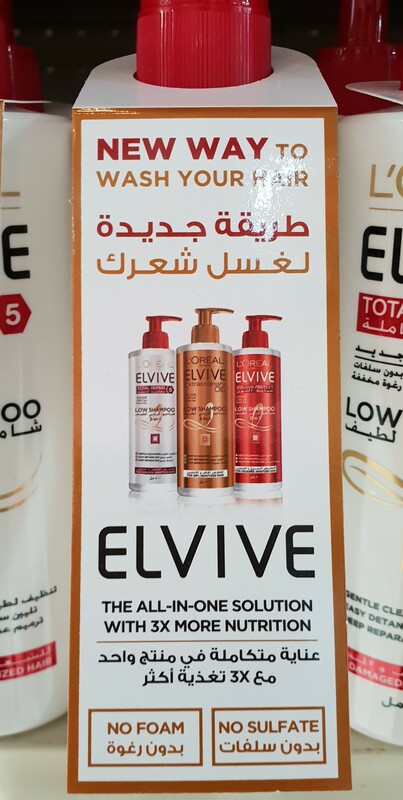 Moving on, there was also a huge display of L’Oreal Elvive Low Shampoo. If you’re wondering what Low Shampoo is, it’s pretty much Shampoo that’s less harsh on your hair. Personally, I find that No Sulfates + No Foam = No Fun … I mean sure it’s kinder to your hair, but I tend to enjoy bubbles so… yeah. 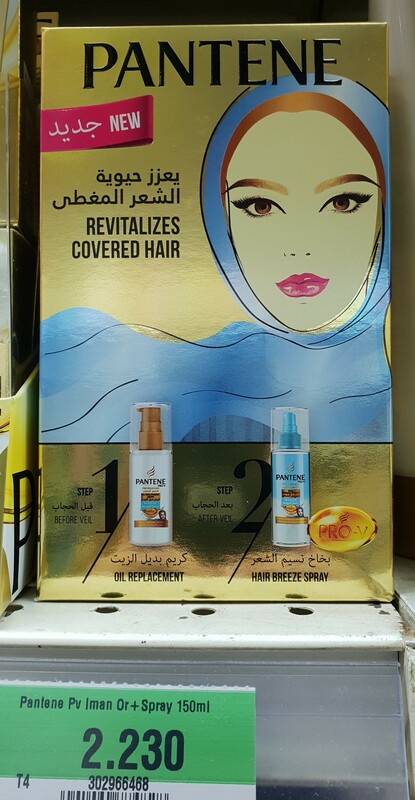 For all the Hijabi Honeys out there, I spotted this cute Pantene Hair Care Set. 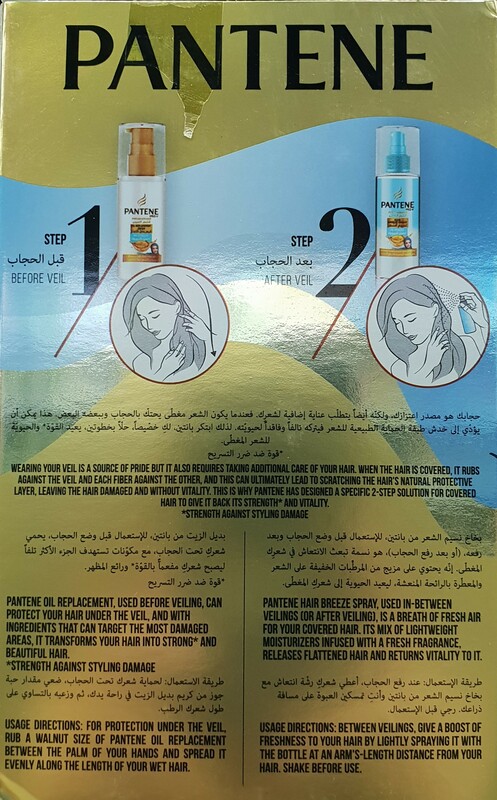 Basically, it comes with Oil Replacement meant to be used on your hair to protect it before wearing the Hijab (veil) and then a Hair Breeze Spray meant to be sprayed after you take off the Hijab. Cute, huh? As for myself, I was super stoked when I spotted this old-school favorite of mine from my teenage years! 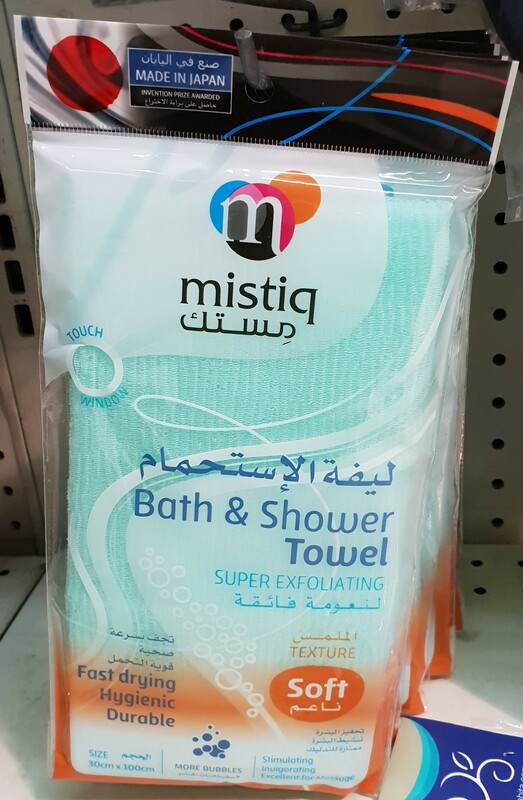 The packaging has obviously been updated several times over, but it’s essentially the same product. I’ve always loved those Pantene Pro-V Ampoules! It does wonders (absolute wonders) for my lion’s mane! Back in the day, these babies (well, same concept, different brand, but also originated in Japan) used to sell like hotcakes on Amazon.com to the extent that they developed a cult following (which was well-deserved, if you ask me). 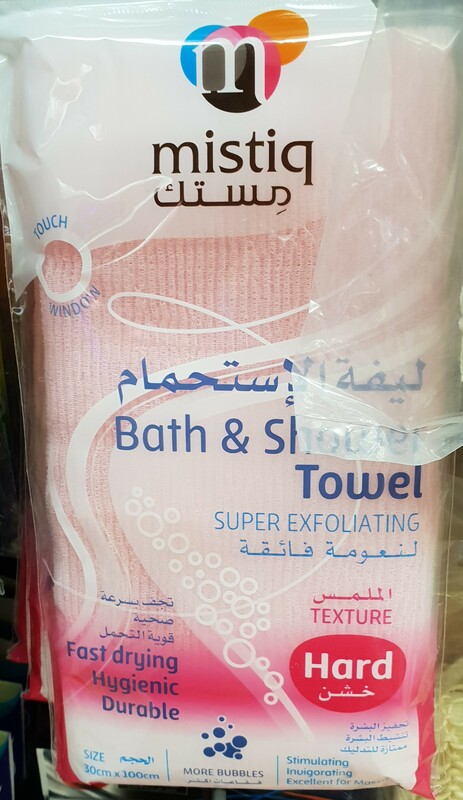 Essentially, these are 30cm x 100cm Bath & Shower Towels that are meant to be Super Exfoliating (music to my ears)! One of the taglines is “less soap, more bubbles”, which is also a big plus for me! As you can see, they come in Soft (teal), Medium (blue), Hard (pink) and Stripes (light pink/dark pink). They’ve also got a little Touch Window (imagine how many people pawed at the thing before you rub it on your body. Fun!) so you can feel the texture of each one and pick out whichever appeals to you the most. 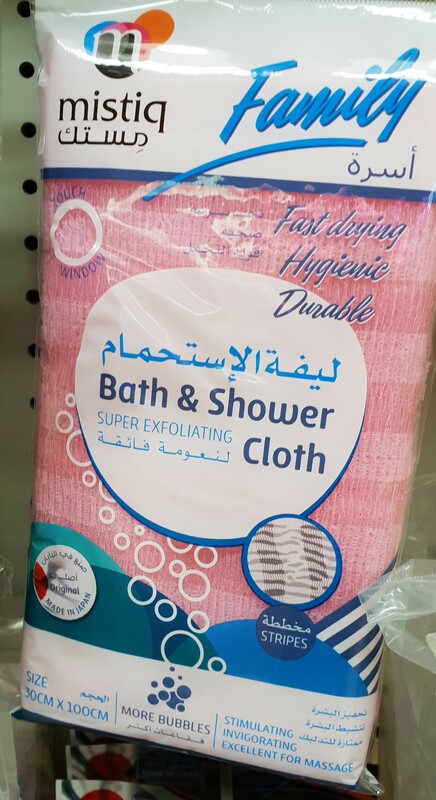 The previous one I purchased from Sultan Center (haulage here) was so bad (it drank up all my shower gels and ate up all my soap… it tried to eat the bath-tub but it wouldn’t fit it’s throat, no but seriously, there was barely any suds or lather, regardless of what I used and it didn’t even exfoliate efficiently)! Anything is a step up, after that. 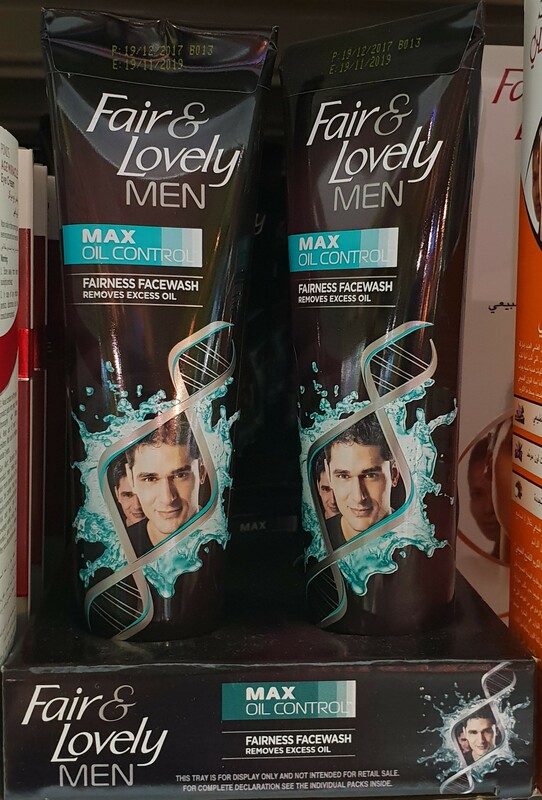 Fair & Lovely… For Men? 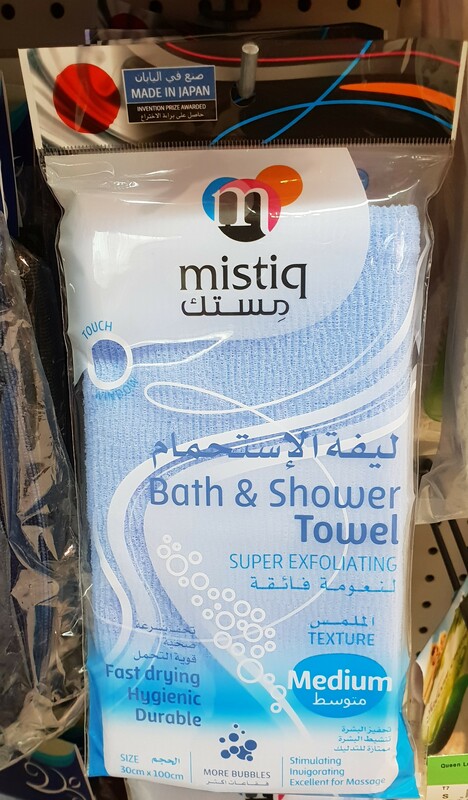 It’s bad enough that women use this stuff, but now men? I didn’t know whether to laugh or cry. 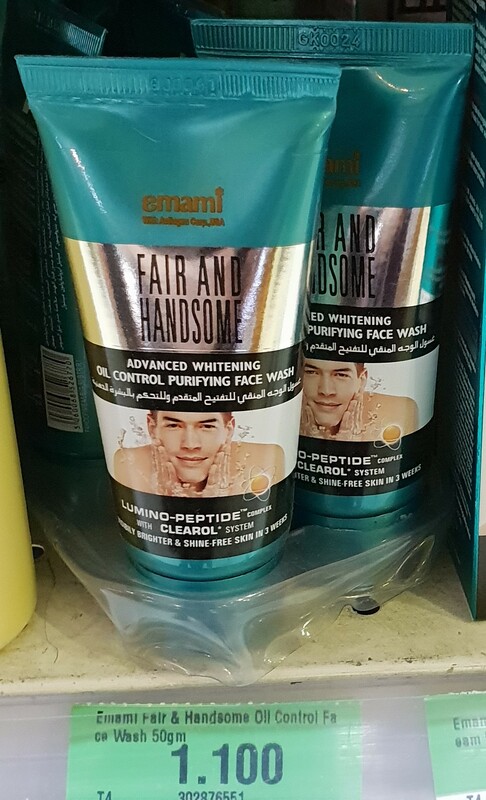 Up until I spotted Fair & Handsome and busted out laughing. I know, I know. People who are unhappy with their skintone is no laughing matter, but you gotta’ admit, those names are ridic! For the record, I’ve got the strangest skintone ever (which is the main reason why I look ethnically ambiguous lawl and people can’t quite place where I’m from), but I embrace it because it’s the hand I was dealt, is all. 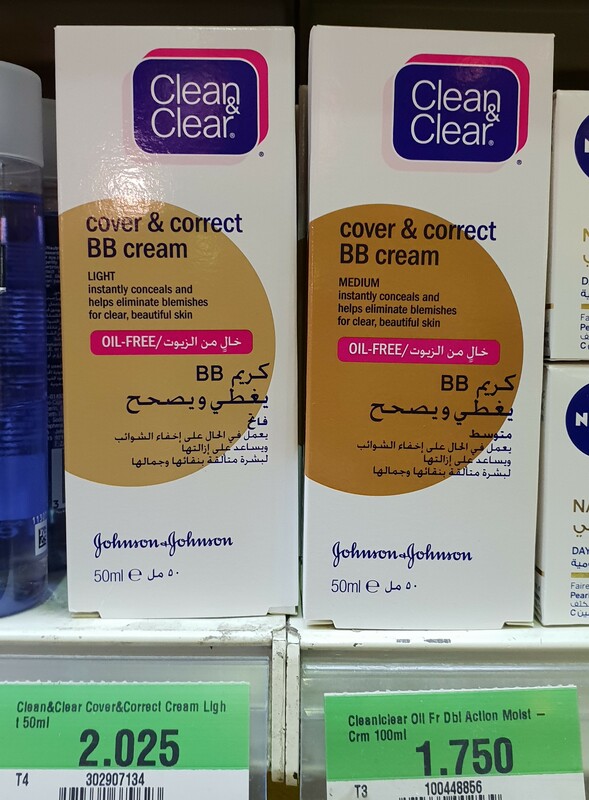 Meanwhile I got all excited that I found a BB Cream in a shade other than “Light“. Hello, my old friend! 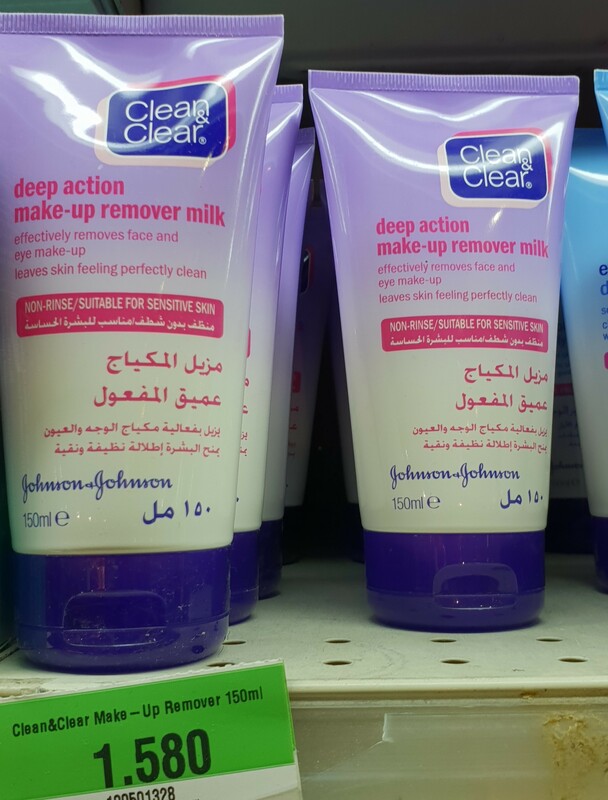 I’ve written up a whole review on this stuff (here) literally titled “Best Makeup Remover Ever“! This was the stuff I mentioned earlier (here), that my bestie stockpiles for her weekly gatherings. 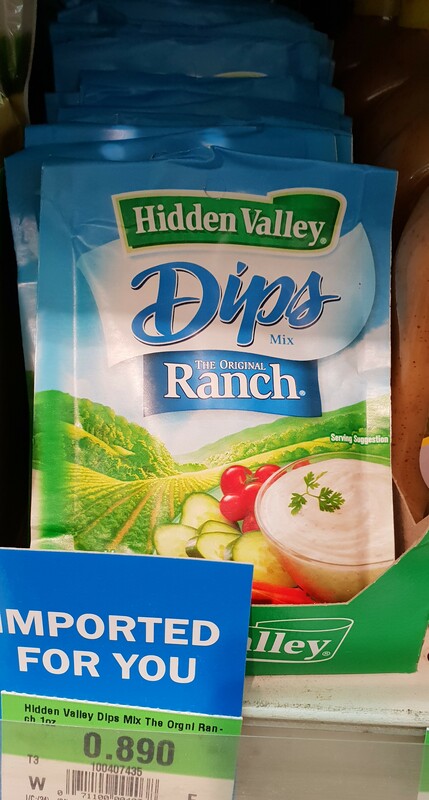 It’s a Powder that you’re supposed to mix in with Sour Cream (personally, I prefer Yogurt which I also picked up from my bestie, but whatevs, to each their own) and boom, you’ve just made Dip. I like pairing it with Potato Chips, but for those who are more health-conscious, you can totally pair it with Veggies, etc… I’ve only seen this stuff come in the Ranch flavor and even then, can rarely ever find the stuff at Souk Sharq (better luck finding it at the Salmiya branch really) which is why I got all excited when I did find it! Like I said, not that many photos because I was hangry. Also, I meant to post this yesterday on the 20th but my internet has been acting up lately, for some reason (shark?) which is why I’ve gotten’ around to doing it now.